4-H livestock projects, including swine, provide great opportunities for youth to learn about animal and veterinary science, as well as animal production practices while gaining valuable life skills such as responsibility and record-keeping. Curious why pigs have so many piglets? 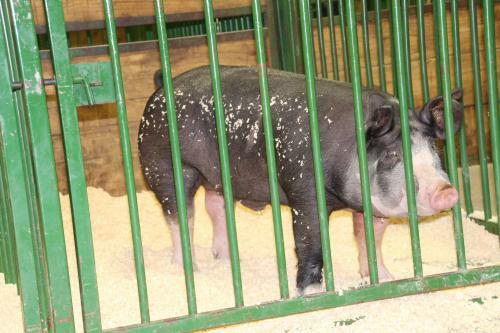 4-H youth will feed, train, show and care for swine project animals as they learn about swine breeds, selection, grooming, production, management, marketing, reproduction, health and agribusiness careers. Both market hogs and breeding stock provide youth with an opportunity to learn more about the swine industry while gaining valuable life skills to help them succeed. In addition to local county events, statewide competitions and educational events are all possibilities as well. Youth can also learn more about their project by completing Youth Pork Quality Assurance Plus certification. Livestock management is a part of Michigan’s important agricultural industry, which is vital to the state’s economy and future prosperity. Participating in a 4-H swine project could set you on the path to an excellent career in agriculture.